Fleetwood Mac : The Very Best of Fleetwood Mac CDTitle: The Very Best of Fleetwood Mac Artist: Fleetwood Mac Genre: Rock/Pop|Rock Duration: 77 mins Format: CD / Album Type: CD No. of Discs: 1 disc(s) Studio / Label: Rhino UK. Fleetwood Mac : Say You Will CD (2003)Title: Say You Will Artist: Fleetwood Mac Genre: Rock/Pop|Rock Duration: 76 mins Format: CD / Album Type: CD No. of Discs: 1 disc(s) Studio / Label: Warner Music UK Release Date: 28 Apr 2003. ORIGINAL CD IN EXCELLENT CONDITION. Fleetwood Mac : Say You Will (Us Import) CD (2003)Title: Say You Will (Us Import) Artist: Fleetwood Mac Genre: Rock/Pop|Rock Duration: 76.40 mins Format: CD / Album Type: CD No. of Discs: 1 disc(s) Studio / Label: Warner UK Release Date: 28 Apr 2003. Fleetwood Mac - Very Best of [Reprise] (2003). Condition is Very Good. Dispatched with Royal Mail 1st Class Large Letter. Fleetwood Mac : Green Shadows CD (2003)Title: Green Shadows Artist: Fleetwood Mac Genre: Rock/Pop|Rock Duration: 72.10 mins Format: CD / Album Type: CD No. Disc 1 15 Jumping at Shadows (Live 1995) 5.12 mins. 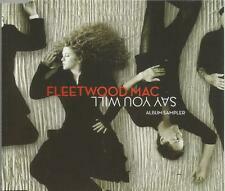 Fleetwood Mac - The Very Best of Fleetwood Mac - Digitally Remastered. Excellent jewel case CD album. NO copies. Issued in the UK on Warners/WSM Records label. From a clean and smoke-free home. Played a couple of times and then stored in a box under a desk in the office. Fleetwood Mac : Madison Blues [with Dvd] CD (2003)Title: Madison Blues [with Dvd] Artist: Fleetwood Mac Genre: Rock/Pop|Blues-Rock Duration: 122 mins Format: CD / Album Type: CD No. of Discs: 3 disc(s) Studio / Label: Shakedown UK Release Date: 20 Oct 2003. Live at Boston Vol. 2 CD (2003)Title: Live at Boston Vol. 2 Genre: General|tbc Duration: 74.40 mins Format: CD / Album Type: CD No. of Discs: 1 disc(s) Studio / Label: Snapper UK Release Date: 24 Feb 2003. EXCELLENT CONDITION CD. BUY IT NOW IS THE COMPLETE ITEM AS PICTURED. FLEETWOOD MAC. UK £0.00, extra copies add £0 per item. This item is in mint or excellent condition unless stated above. CATALOGUE No. 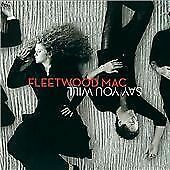 Fleetwood Mac - Say You Will (CD, Album, Enh). 7 Say You Will 3:47. 17 Say Goodbye 3:24. Why choose Daddy Pop?. 10 Smile At You 4:32. 12 Silver Girl 3:59. 11 Running Through The Garden 4:33. 5 Miranda 4:17. Fleetwood Mac. Man of the World. Family Man. "The Very Best Of. Go Your Own Way. Disc And Case In Excellent Condition. Over My Head. Don't Stop. 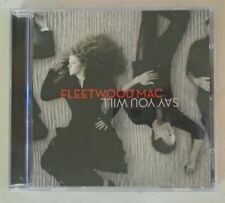 Fleetwood Mac- The Very Best of - CD -. CD, CASE AND. 1 disc edition, in excellent condition. FLEETWOOD MAC - Peacekeeper German 2003 Reprise promo CD includes Peacekeeper (Single Mix) & Peacekeeper (Single Mix Edit), card picture sleeve PR03903. Label: REPRISE. Title: SAY YOU WILL ALBUM SAMPLER. Artist: FLEETWOOD MAC. Year: 2003. Fleetwood Mac - Say You Will. 2003 Warner/Reprise CD Release. Two single versions and Big Love Live 1997 are also included. CONDITION: CD is in LIGHTLY USED condition. Pictures are of actual item. USA / Asia / Rest of World £5.50. ALL CD’S, TAPES AND VINYL ARE UK ORIGINALS UNLESS OTHERWISE STATED. CD’S & 7” SINGLES. EX – EXCELLENT. UK - £1.40. REST OF THE WORLD - £5.00. UK – £3.00. THIS USED CD IS IN EXCELLENT CONDITION. UK, 1.50 SECOND CLASS AND. 1.00 FOR EACH ONE AFTER. Fleetwood Mac - Green Shadows - Featuring Peter Green. Jumping At Shadows. Long Grey Mare. The Green Manalishi. Black Magic Woman. No Place To Go. Shake Your Moneymaker. Love That Burns. All dvds unless otherwise stated, are REGION TWO. Covering a wide range of genres. from classics to the latest releases. 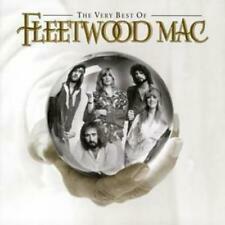 HERE WE HAVE MY Fleetwood Mac - Very Best of [Reprise]. ALL CD'S ARE CLEAN THE COVER AND SLIP CASE VERY GOOD. VERY GOOD CONDITION. 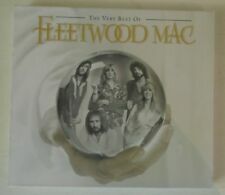 Fleetwood Mac Say You Will (2003) in excellent condition. Audio CD (15 April 2003). Say You Will. Say Goodbye. Smile At You. Everybody Finds Out. Bleed To Love Her. Steal Your Heart Away. Silver Girl. FLEETWOOD MAC Say You Will ​First Edition Enhanced CD THIS IS AN ORIGINAL 2003 USA RELEASE TRACKS: 1 What's The World Coming To 2 Murrow Turning Over In His Grave 3 Illume (9-11) 4 Throw Down 5 Miranda 6 Red Rover 7 Say You Will 8 Peacekeeper 9 Come 10 Smile At You 11 Running Through The Garden 12 Silver Girl 13 Steal Your Heart Away 14 Bleed To Love Her 15 Everybody Finds Out 16 Destiny Rules 17 Say Goodbye 18 Goodbye Baby CD: EXCELLENT INSERTS: EXCELLENT. FLEETWOOD MAC. THE VERY BEST OF CD. Man of the World - Fleetwood Mac. Don't Sleep In The Subway Darling - Petula Clark. Audio CD(6 Oct. 2003). Young Girl - Gary Puckett. Brown Eyed Girl - Van Morrison. Everlasting Love - Love Affair. Love Grows - Edison Lighthouse. Peacekeeper - Single Mix. Peacekeeper - Single Mix Edit. FLEETWOOD MAC. USA £0.95, extra copies add £1 per item. This item is in mint or excellent condition unless stated above. CATALOGUE No RECORD LABEL. Great 2000's CD. - - - ALL PICTURES ARE OF THE ACTUAL ITEM YOU WILL RECEIVE - - -. Fleetwood Mac - Go Your Own Way 3:39. Fleetwood Mac - Don't Stop 3:11. Fleetwood Mac - Dreams 4:16. Fleetwood Mac - Little Lies 3:37. Fleetwood Mac - Everywhere 3:42. Fleetwood Mac - Albatross 3:08. Fleetwood Mac - You Make Loving Fun 3:33. Artist: Fleetwood Mac. Throw Down. Title: Say You Will. Say You Will. Say Goodbye. Format: CD. Release Date: 12/04/2003. Condition (Sleeve/Disc): New.